Groats can refer to any whole kernel of grain that has been minimally processed so as to remove its outer husk or hull, sometimes called chaff. Groats are a whole grain that retains the germ and bran. They have a hearty, chewy texture and must be soaked or simmered to soften them when cooking. Groat is an old Scottish word that referred to oat groats. Wheat, oats, and barley can be processed into groats. Steel-cut oats are sliced oat groats. Bulgur is another name for wheat groats, which are par-boiled and used in making tabbouleh and other dishes. 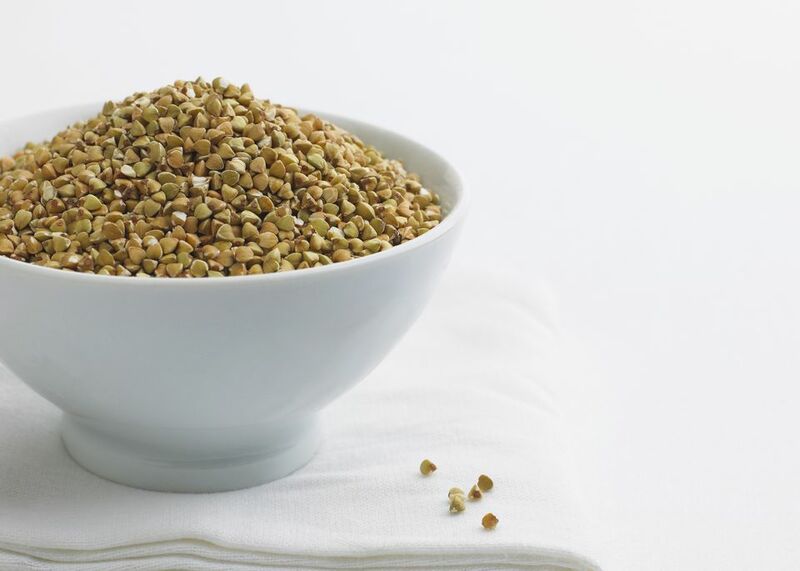 Alternately, the word groats can be used to refer to buckwheat in its whole kernel form. It is a relative of rhubarb and a gluten-free grain. They are used in making kasha, a porridge staple in Eastern Europe. Groats retain the high-fiber bran of the grain, which also contains protein, iron, fatty acids, and B-vitamins. They also still have the germ, which is high in polyunsaturated fats and contains vitamins and minerals. In addition, you still have the nutrition in the endosperm, which is the starchy part of the grain that is usually all that remains to be ground into flour. A quarter cup of oat groats contains 160 calories, 4 g of fiber, providing 16 percent of the recommended daily value, 3 g fat, 7 g of protein, 28 g of carbohydrates, and providing 10 percent of the daily value for iron. Buckwheat groats are a gluten-free grain found in traditional Eastern European cuisine. It is a complete protein providing all of the essential amino acids. Groats are usually prepared first by soaking and then slowly simmering until they are soft. Buckwheat groats are prepared in this manner to make the traditional Eastern European dish called kasha. Refer to the recipe you are using to get the cooking directions when you prepare groats. If you are substituting grains or using cut or crushed groats, the cooking time may be different. Roasted buckwheat groats are also called kasha or kashi and used in many Eastern European dishes. These can include kasha used as a stuffing or side dish with meat. Kasha Varnishkes are a traditional Jewish recipe with bowtie pasta and buckwheat groats. Blood sausage or black pudding is made with buckwheat groats or barley groats. The groats provide more texture in these traditional preparations that aim to leave no part of the animal unused. In England, groaty pudding is made to eat on Guy Fawkes Night. It's a baked dish that includes groats that have been soaked first to reduce the baking time, beef, leeks, and onion. It still takes a very long time to bake. Some people buy groats to mill into their own flour and retain all of the nutrition of the whole grain. Such flour would have a shorter shelf life due to the germ, but home cooks might mill the flour immediately before using it.